After spending summer in the northern hemisphere and watching the arrival of autumn, coming back into Sydney's summer is welcome, but also confusing. My internal body clock is not sure if I should be getting ready for the holidays or planning a beach weekend (or both?!). Whether this time of year for you is about chestnuts roasting on the open fire or a cold seafood picnic on the beach, it's probably also about showering your loves ones with holiday cheer. And maybe even a present or two? I've been working hard on compiling a holiday gift guide to help you find the perfect (sustainable) gift for those on your shopping list. And where else would I begin but with items I'd love in my wardrobe? Handmade in Portugal, this fashion-forward footwear label is making great strides towards a fabulously chic future based on fair work practices. 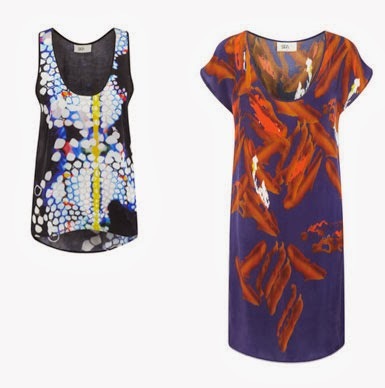 The lovely, draping of these tops and dresses combined with the bold prints make this a label to watch. The gorgeous texture is thanks to the material, Cupro, made from recovered cotton waste. I am in love. A hot bomber jacket, made to order out of upcycled leather. Santa, I promise I've been a very good girl this year! It wouldn't be a shopping guide if I didn't include a gorgeous piece of jewelry from Raven & Lily, made by HIV-positive women in Ethopia from recycled bullet casings and coins. I love this drapey white t-shirt, too, made from upcycled jersey cotton. I think this eco-leather belt bag is too cool for words. Fashionably utilitarian, and made by artisans at a Fair Trade certified factory in India from leather free from chrome and harsh metals. Buy in Australia through Indigo Bazaar. Also available through Indigo Bazaar, this pencil skirt is made to order from reclaimed military gear and vintage fabrics. Allow around 2 weeks for delivery - better order now for a chance at getting it before Christmas! Handmade in Los Angeles with quality natural fabrics and vegan leather, this is a beautiful ready-to-wear line with a cruisy California vibe. I love the coral colour of this denim! 100% American made, cut and sewn in LA from denim milled in the US, available on Modavanti. This online store sells ethical jewelry and accessories. 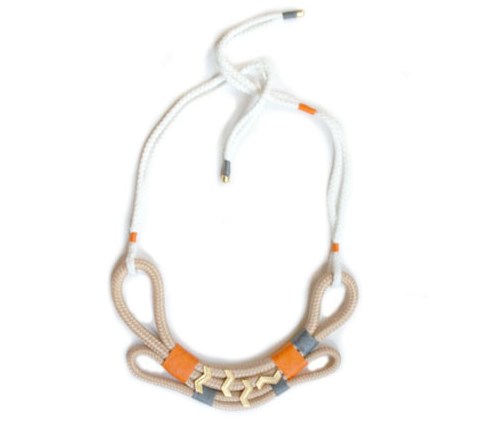 I really love this Mali Necklace by Pichulik Designs, handmade by women in South Africa. I'm completely smitten with this bright and airy nightie, which is made of GOTS certified organic cotton jersey and dyed with eco-friendly inks. Sleep tight! When all else fails, gift cards are a fabulous choice for hard-to-shop-for fashion lovers (and aren't we all a little hard to shop for?). Gift cards are available for the following sustainable fashion online stores. Email service@modavanti.com to organise a gift card. Happy holiday eco-shopping! Stay tuned for more holiday shopping guides later in the week. A huge shout out to the Ethical Fashion Forum and their Source Awards for much of the guide's inspiration. Congratulations to all of this year's winners!